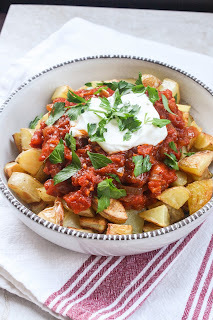 The Hungry Bawarchi: My Experience with Patata Bravas. My Experience with Patata Bravas. On my recent trip to Spain, there is one this that I made sure I had at every city I visited. It was their native dish - Patata Bravas. The dish is mainly deep fried potatoes which are cut into irregular shapes and then served with a tomato sauce and aioli. It is a kind of tapas which one can find through out Spain in restaurants and bars which will compliment your drink perfectly. I was traveling through the below cities and post that I will tell you where was the best Patata Bravas I had and what made it special. 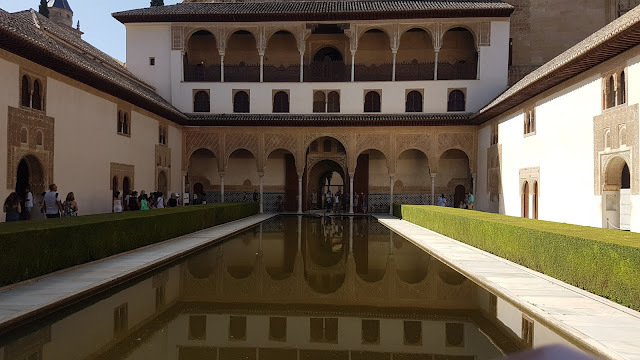 I started off with Barcelona, visited Costa Brava, then Seville happened after which I landed in Granada, the trip continued to Madrid, Segovia and lastly in Valencia. The reason I decided to take the quest up to check as to where you can get good Patata Bravas. All the restaurants in order to try them were located in the city center very close to my accommodation and after asking the hotel/hostel staff. The first place where I tried them was in Costa Brava during lunch, they came along with my set menu. The potatoes were crispy, tangy, spicy sauce. The main issue here was that the potatoes were quite huge in size. They should have been a little small. The restaurant was located in the lanes of the new village in the north of Costa Brava. While roaming around Barcelona, I was in plaza Catalunya and came across this restaurant close to Hard Rock Cafe in the direction towards La Rambla. Over here the dish was better than the one I had in Costa Brava. The portion size that I got for the cost was quite generous and I was full by the end of the plate. Smaller potatoes, more sauce, little extra spicy (I asked them to add in some more chilies), creamy just the way I had imagined them. Seville and Madrid, the Patata Bravas were not close to my expectations and I honestly did not enjoy them. The aioli was missing. the potatoes at both these cities were hard, seemed a bit undercooked. The ones I got in Seville were served with some slices of bread on the side. It was time for the ones in Valencia. (I know what you are wondering, where did Granada disappear. Well, I'm saving the best for the last.) Potatoes were perfectly cooked, soft in the center and crispy on the outside. The only issue here was that the amount of sauce the restaurant provided was very less and we had to ask for me to which they looked a bit surprised. The restaurant here was located in Carrer De Samaniego. Lastly, it was Granada that stole the whole war for the best Patata Bravas away. I was staying just opposite the Cathedral and in the lane next to my hotel, there were quite a lot of options for bars where one can just sit, enjoy the drink and have free tapas. (Yes, free tapas, in Granada, with every drink, you get a free tapas) Walking down the streets of Calle Elvira, entered a bar to grab a drink and that's where I got the Patata Bravas. The bar was small, not very fancy in terms of ambiance but good food and this is where I tried the local beer as well (about that another post will come up soon). So back to the food, the potatoes were crispy on the outside and soft on the inside just like the ones in valencia. The sauce coated each and every potato. Perfect tangy, spicy and flavorful with a good amount of the aioli which did not over power the taste of the tomatoes as well. In order to sum it up in a few lines, as to what I had, Granada served me the best patata bravas but I might be wrong as well because there are so many restaurants in each city serving the same and I might have landed up at a wrong place to try them in that city. In case you have tried the same at any other place and know where one might get the best, please leave it in the comments below so that the readers visiting the country can visit it and give it a try. Lastly, you can follow me on Twitter - @HungryBawarchi, Instagram - HungryBawarchi & Facebook - The Hungry Bawarchi for food and travel updates. Thankful to you for this radiant receipt! I've made this lemon bisque for Christmas for my family and it was so magnificent and amazing that they eat it in 10 minutes. I ought to have rushed to endeavor even a touch of this cake. That is the reason I expect to cook it for New Year party for my colleagues and they will say that the true Martyr is me .